Always attention to detail, technical skills, passion in our work and great attention to customer needs are the strengths that have allowed us to excel in the field of sale of Airbrush Iwata Revolution HP TR2 0.5 Trigger. Consultando il catalogo di Aerografando you will immediately notice how vast it is and how diversified the model range is Revolution, you will find the best Airbrush Iwata Revolution HP TR2 0.5 Trigger offers at the best prices on all Airbrush Iwata Revolution HP TR2 0.5 Trigger of the brands Iwata. Start off airbrushing with the industry leader – Iwata. Made for users at all levels, the Revolution Series features top-of-the-line airbrushes at a great value. With breakthrough technology and performance, these airbrushes outperform all others in their price range. Featuring a uniquely designed Pistol Trigger with a fixed dual-action operation, the Iwata Revolution TR Airbrushes deliver comfortable, ultra-smooth performance that’s ideal for custom automotive painting. Equipped with the new FA450 Iwata Pistol Grip Filter that acts as a superior defense against moisture, the HP-TR1 and HP-TR2 give total control over paint and spray just like conventional airbrushes. Their designs offer the same comfort and feel that’s typical of a larger spray gun. Each is impervious to solvent-based paints thanks to the PTFE packing needle seal, which can be easily replaced. The HP-TR1 (0.3mm) comes with a 1/4 oz. side-mount color cup, while the HP-TR2 (0.5mm) sports a 1/2 oz. side-mount cup. 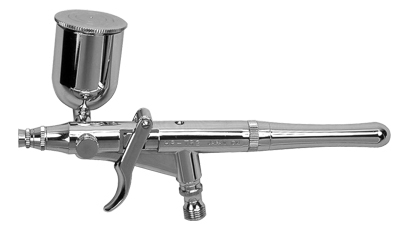 · Ergonomic, balanced handle makes for easy, level spraying. · The FA450 Pistol Grip Filter can be used with the 1oz. and 2oz. side-mount bottle sets (sold separately). Read the reviews of our customers on Airbrush Iwata Revolution HP TR2 0.5 Trigger of the category Revolution. With us you will find only satisfied customers, thanks to a technical assistance made by those who really know the world Revolution. Review Airbrush Iwata Revolution HP TR2 0.5 Trigger of the brand Iwata. Trust in the quality and professionalism of Aerografando on the sale of Airbrush Iwata Revolution HP TR2 0.5 Trigger, only from us you will find the best prices. You want to have more details on Airbrush Iwata Revolution HP TR2 0.5 Trigger R5500 or more generally on ours Revolution? You are looking for a Revolution but do not you find it in the catalog? Staff of Aerografando will answer all your requests.